Here at Van Buren Local Schools Mr. Zender, our guidance counselor is to be a resource person, a coordinator, a consultant, a group leader, a person who helps teachers, adults, and parents understand children. Mr. Zender is specially trained to help students and parents determine exactly the right courses to provide students with the background for any career. Students meet with counselors each year to ensure that they are on the right path to graduation and to help with any problems or career choice changes that occur. Mr. Zender will also help to see that students meet all of the qualifications to enter the college or career of their choice. Note: It is important that you enter the exact code as seen above. The Valedictorian and Salutatorian selection criteria started with the class of 2016. Colleges are being scheduled to visit Van Buren this fall. More will be added on a daily basis. To schedule a college visit, visit the college web site. Once the visit is scheduled, see Mr. Zender for approval and visitation form or download below and sign to bring in. Seniors are permitted two visits from school and juniors are permitted one visit in the 2nd semester. Please fill out, print, return to Mr. Zender prior to visit. 2019 Senior Awards Program will be posted as soon as it is scheduled. Please forward any accepted scholarships to me for presentation at the awards!! *Parents and family members are welcome to attend! Scheduling for 2019-20 school year will begin in February. Dates will be posted when set in December..check back then! PSAT/NMSQT Test: October 11th for interested 11th graders. To be given at VBHS. Sign up in guidance office if interested. END OF COURSE MAKE_UPS: UPDATE! The End of Coures Exam make-ups will begin on December 3rd. We have a 15 day window to complete all make-ups. Those students who did not take the exams last year or who need to increase their points need to take these. See Mr. Zender for more information. ACT: 2018-19 DATES: Sept. 8; Oct. 27; Dec. 8; Feb. 9; April 13; June 8: July 13. Also the Ohio Dept. of Education will be providing a one time FREE ACT exam for all juniors. This will be given MARCH 12th. Updates to follow! 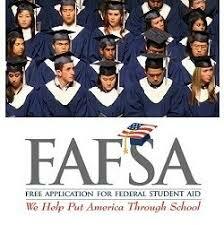 Starting in fall of 2016, students/parents will be able to register with the FAFSA starting OCTOBER 1st. You will also use your tax returns for the 2015 year. More info will be sent home with seniors!